Azimüth was born out of the bossa nova and jazz scenes in Rio de Janeiro in the 1960’s. Keyboard player and bandleader Jose Roberto Bertrami (RIP), drummer Ivan ‘Mamao’ Conti and bass player Alex Malheiros met during that time and recorded an album called ‘O Trio’ in 1968 under the name ‘Projeto 3’. 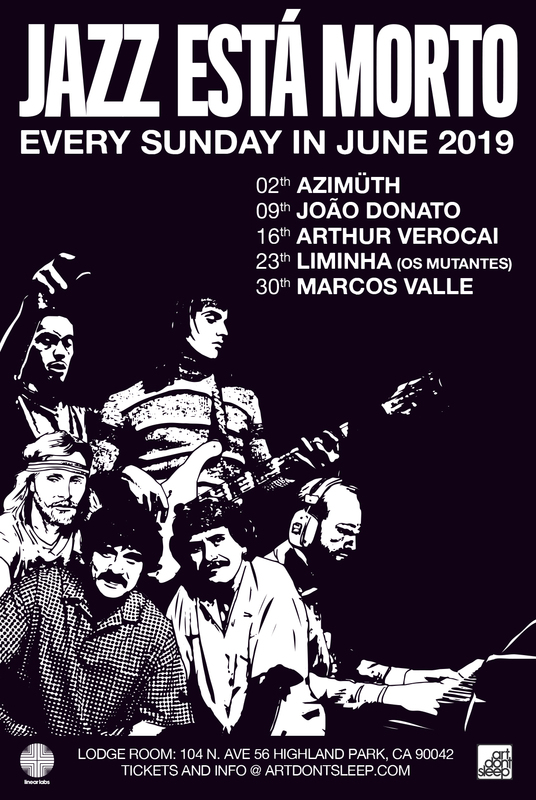 ‘Projeto 3’ changed their name to ‘Azimuth’ after backing the recording of ‘O Fabuloso Fittipaldi’ for Marcos Valle in the early ’70’s – ‘Azimuth’ is a track title from that album. Their first recording under the new name was a four-track EP for Polydor in 1975. This was followed by their first full-length self-titled LP for Som Livre also in 1975. ‘Agua Nao Come Mosca’ came in 1977 and was also released outside Brazil – in the USA and Japan – by Atlantic Records. In 1979 they released ‘Light As A Feather’ for legendary US jazz label Milestone – it became one of the best-selling records of the year and features the all-time classic disco/fusion dancer ‘Jazz Carnival’. This isn’t our first time bringing the trio to Los Angeles. Back in ’08 we brought them to the Echoplex and in 09’ we brought them as part of the rhythm section in Arthur Verocai’s “Timeless” concert. This time, we bring them back without Bertrami, but very much in tact.